Vulkan appears to be gaining momentum of late. The only cautious blip on the radar recently, due to a slide suggesting its support for multi-GPU was Windows 10 exclusive, was simply a misunderstanding. In other recent news the cross platform 3D gaming API from the Khronos Group has got support in CryEngine and Unity gaming engines, it looks set to be used in more new games coming from Bethesda, and Star Citizen has embraced Vulkan in preference to DX12. Late last year we heard that Futuremark was to implement Vulkan API support in its benchmarks and today that plan began to materialise in the shape of available software updates. 3DMark 2.3.3663, which is downloadable immediately, is described as "a major update that adds Vulkan support to the API Overhead feature test". 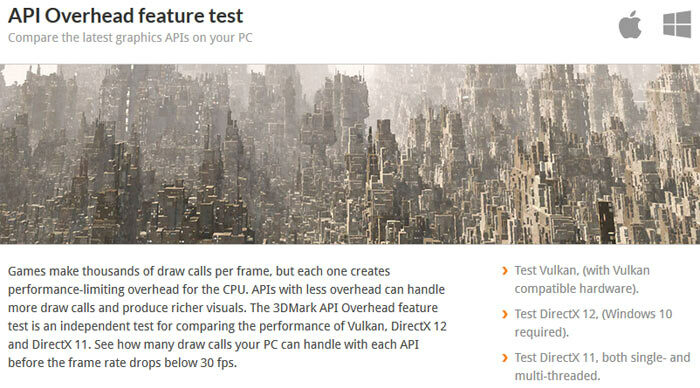 From now on, 3DMark users will be able to compare the Vulkan, DirectX 12, and DirectX 11 API performance on their PCs. In addition to this updated benchmarking software, your PC hardware will have to offer Vulkan support,and have compatible Vulkan supporting video drivers installed. As Vulkan API support arrives, Mantle tests are removed. Elsewhere in the update, the SystemInfo scan time has been greatly improved for X99 systems. Various issues have been fixed too. There was a bug that meant the API Overhead feature test to fail to show a score at the end of a run on some systems - that's now been fixed. Furthermore, Time Spy test crashing due to a corrupted shader cache, and a scaling issue on 1080p monitors at high DPI settings, have been patched. Nvidia is so screwed… LOL! Anybody owning Nvidia should start dumping their ware now! Open standards for everyone! AMD!